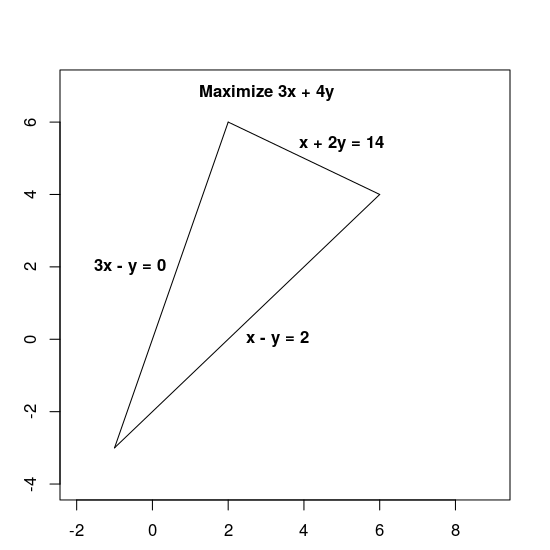 This section shows how to run a C++ program that solves a very simple optimization problem: find the maximum value of the objective function x + y, subject to the constraints 0 ≤ x ≤ 1 and 0 ≤ y ≤ 2. Copy and paste the code above into new file, and save it as program.cc. Note: You must run the above command from the top level of the directory where you installed OR-Tools. 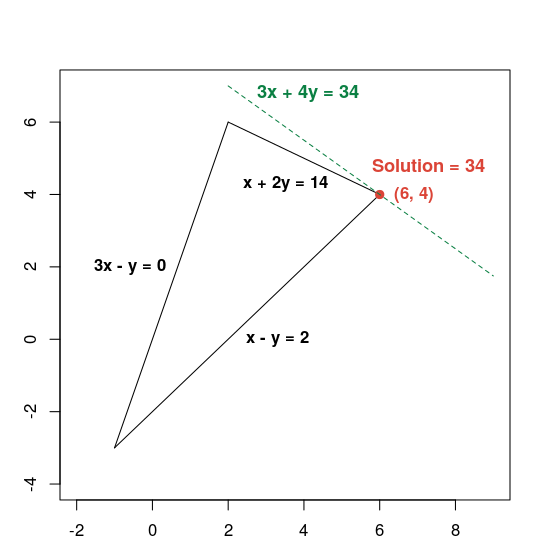 Next, we give an example of an optimization problem, and show how to set up and solve it in C++. Create the variables using the method MakeNumVar. Define the constraints using the methods MakeRowConstraint and SetCoefficient. MakeRowConstraint(-infinity, 14) creates an inequality constraint in which the left side is less than or equal to 14.
c0->SetCoefficient(x, 1); sets the coefficient of x to 1.
c0->SetCoefficient(y, 2); sets the coefficient of y to 2. Define the objective function. The method SetCoefficient sets the coefficients of the function. The method SetMaximization makes this a maximization problem. Declare the solver. In this example, we use the OR-Tools linear solver wrapper to invoke Glop, Google's linear optimizer. The following code declares the solver. // x and y are non-negative variables. You can run the program as shown in Running a C++ program above. OR-Tools includes a number of C++ example programs that illustrate how to solve various types of optimization problems. The examples are in the examples/cpp subdirectory of the directory where you installed OR-Tools.